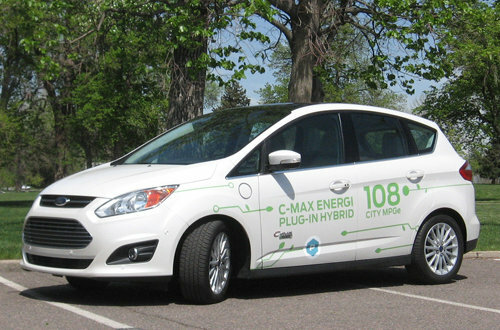 Ford's C-MAX Energi is perhaps the perfect balance between a hybrid drivetrain and plug-in enhancement of already excellent efficiency and versatility. Remarkably it doesn’t even cost that much if you can take full advantage of the $7,500 Federal tax credit plus whatever may be offered by the state where you reside. Without knowing anything about electric cars or hybrids you can enter this car and drive it like you would any other, excluding those with V10 or big HEMI engines, of course. Other than being perfectly quiet when you first turn it on, it drives much like any modern car – accelerating very well when called upon to do so, gracefully slogging through heavy traffic while barely sipping petrol, and retrieving battery energy every time you brake or descend a hill. Speaking of hills, small engine vehicles used to have a hard time with them – straining little cylinders and pistons until you thought they would burst. Not so with the C-MAX Energi. It is happy to climb small hills or long grades easily – or like a Mississippi River Boat Queen – fast and hard. Along the way it gently informs a driver how special it really is. When you stop, a small graphic on the left of the instrument cluster tells you how much retrievable kinetic energy was reclaimed. There’s something pleasant involved when it states 99 or 100 percent of braking energy was returned to the battery. The 2013 C-MAX Energi is rated to get as much as 108 MPGe in normal driving – as we kept an eye on our average MPG reading, an ongoing computation by the vehicle, the actual mileage ranged from 65.2 to 88.3-mpg as we crossed the metropolitan area four times in different ways. This involved slow residential driving, faster speeds on main thoroughfares, speedy highway driving, plus ascent and descent of minor grades. Starting with a full charge and low gas tank, approximately 60 miles used up less than half the C-MAX Energi’s charge and very little gas at all. It has a total of 188 horsepower with engine and motor combined, a top speed of 85 (in all-electric mode) and a 21-mile range on pure electric power. With a full tank and full charge, the 2013 C-MAX Energi can travel 620 miles without refueling or plugging in. Plus virtually no car today is without regenerative braking, one of the hybrid’s gifts to the automotive world. The 2013 C-MAX Energi starts quietly because of its EV function, but is well insulated from street noise as well. Quiet driving is something usually found in luxury makes, but the threshold of a peaceful commute is coming down in price. All of Ford’s plug-in models have a three mode functionality allowing the use of electric power in combination with hybrid drive, or hybrid power only reserving the battery charge for later or full electric power independently on demand. These modes are respectively known as Auto EV, EV Later and EV Now. This feature is also found on the Fusion Energi. Paul Aldighieri, Ford Ergonomics Engineer, brought up an interesting point at a recent Power of Choice presentation, regarding Ford’s current array of electrified vehicles. The C-Max hybrid, C-Max Energi, and Focus Electric all are built interchangeably without retooling on the same line as the gas-powered Focus, however the Fusion Hybrid and Fusion Energi are made in a different plant, he said. This allows Ford to more rapidly adapt to the marketplace by producing more of the models most in demand. That means whatever powertrain the public decides is right, the brand can readily produce the model most in demand as needed, and still turn a profit. The C-MAX Energi is roomy, comfortable, performs well and is competitively priced. The one downside of the plug-in version is the added battery capacity takes up some of the cargo space, but it gives back a lot in return at the pump. Rear seat floor storage compartments help to make up some of the lost room. From our perspective, a plug-in hybrid makes a lot of sense for the foreseeable future. The C-MAX Energi has more horsepower, fuel capacity, range, fuel efficiency and room for occupants than the Chevrolet Volt or Toyota Prius. The C-MAX Energi comes with a cord to plug it in to a 110-volt outlet, taking seven hours to charge fully from zero power. An optional 240-volt charging unit is available from third party installers and can cost from $300 to $1,000, depending on your fuse box and the distance the circuit must travel. With this unit the Energi will recharge fully in just 2.5 hours. If you live somewhere in what was once labeled as the Great American Desert on 19th century maps,otherwise referred to a the American Southwest, Ford will provide a connection to SunPower, allowing the investigation of a solar roof producing up to 3,000 kW annually. MyFord Mobile, an available smartphone app, enables owners to manage vehicle recharging when electricity is at its cheapest and even allows pre-setting a interior temperature for the Ford when departure is planned. The model driven had a total listed price of $35,440 and Ford may discount the federal and local tax incentives for you, greatly reducing the price of the vehicle to the consumer. In conclusion, the 2013 C-MAX Energi has a lot going its way and for anyone concerned with saving money for life’s other concerns it might well be worth a look. Ray Gerbich, Master Sales Consultant, for the local Ford dealer who graciously granted our test drive, said he had recently called a buyer to ask how they liked their new C-MAX Energi. The couple was expecting and hubby helped his wife pick out the C-MAX – to free up funds for the coming bundle of joy.